*This first appeared on my Asia’s On My Mind column on FIBA.com. Six years ago in the 2009 FIBA Asia Under 16 Championship, Chinese guard Guo Ailun turned a lot of heads with his speed and flair. He was a refreshing sight from the usual mold of Chinese guards who, though effective and productive, were certainly wanting in panache. With Guo at the helm, China swept all its nine games to qualify for the 2010 FIBA U17 World Championship, where they won four of eight assignments and finished at seventh place. Due to his skill, Guo was elevated to the senior level shortly after, playing for China in the 2012 FIBA Asia Cup. At just 18, he was also the youngest competitor in the 2012 Olympics Men’s Basketball Tournament, though he played in only 3 games, recording averages of 3.3 points and 1.0 rebound per encounter. Because of these, Guo was anointed as one of the spearheads of the future of Chinese hoops. He seems arrogant as hell, but one cannot deny his talent. Understandably, hopes were high that Guo would be able to impress even more in the 2013 FIBA Asia Championship in Manila. With bemedalled Greek coach Giannakis Panagiotis at the helm, China went in as the defending champions and title favorites. Things, however, didn’t pan out as Team Dragon, plagued by a couple of injuries and having to adjust to coach Giannakis’s play style, crashed out of podium contention after losing in the Quarter-Finals to rival Chinese Taipei. China would go on to finish a disappointing fifth place, the lowest that a full strength Chinese squad has ever finished in an Asian tournament. Guo had steady numbers in that competition, averaging 8.1 points and 2.3 assists per game, but he was shaky in the big matches against Korea, Iran, and Chinese Taipei, where he put up a total of just 7 points on 3-of-11 field goal shooting. There were definitely flashes of brilliance in his play, but, by and large, Guo needed to grow in terms of maturity and savvy if he was to truly rise to the continent’s top tier. Fast forward to the 2015 FIBA Asia Championship. Guo Ailun, after norming 10.9 points, 3.2 rebounds, and 4.0 assists per outing while also shooting 54.8% from the floor, has blossomed into a bona fide household name, joining compatriots Zhou Qi and Yi Jianlian, along with Jayson Castro of the Philippines and Samad Nikkhah Bahrami of Iran, in the All-Star Five. Guo was noticeably steadier in this tournament compared to two years ago, leading his team throughout the competition, especially in the critical moments. 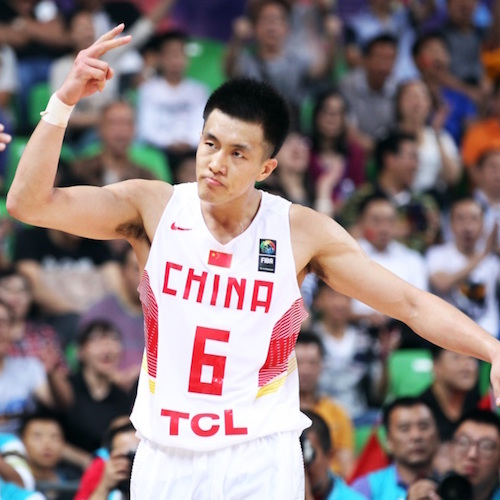 He hit the all-important go-ahead assist against Korea in the group stage, and he also saved his best game for last, outplaying Castro in the Final as China romped to the title, 78-67. Guo stamped his class in that match, dropping 19 points, 6 rebounds, and 2 triples. After conquering Asia, Guo is set to return to the Olympic stage and, now four years the wiser, he is expected to make a much bigger impact than he did in 2012. The competition will be much tougher many times over, of course, as world-class playmakers like Steph Curry, Patty Mills, Sergio Llull, Mantas Kalnietis, and Marcelinho Huertas are already waiting. Nevertheless, as Guo ascends the scaffolds of Chinese and World basketball, he represents a bright future for Asian hoopsters everywhere.